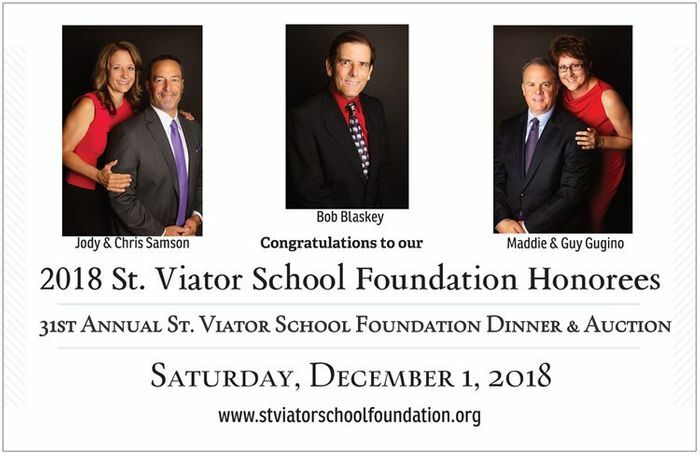 For 31 years the St. Viator School Foundation finances capital improvement projects on campus through one fundraiser each year - our Annual Dinner & Auction. Proceeds from last year's event financed technology infrastructure enhancements and the Junior High iPad program. This year, proceeds will renew the school Computer Lab and classroom computers in Grades PK-8. Each year, the Foundation also honors individuals who have demonstrated exceptional service to the St. Viator Community. The St. Viator School Foundation began in 1988 as the official fundraising arm of St. Viator Parish School. A group of dedicated parents worked together with parish, school, and diocesan administrators to create a new revenue source – the Foundation – to fund future capital improvement projects on campus. These forward-thinking parents organized the Foundation to hold one annual fundraiser – a dinner and auction. Funds would not be expended on projects until the Foundation account reached a threshold amount, which took twelve years. In fact, most of the children of the founding parents had graduated before the first Foundation projects were sponsored. These families believed in the value of Catholic education and the importance of the St. Viator community. We share their sentiments. Where Does the Foundation Receive Its Funding? From you, our faithful donors! The Foundation holds one annual event to generate revenue for capital improvement projects that benefit the St. Viator community. The event’s silent and live auctions produce much of the Foundation’s revenue. However, funding is further augmented through the sale of program advertisements, raffle tickets, sponsorships, event tickets, and dinner tables. To further enhance available funding for campus projects, the Foundation is run entirely by volunteers, with no paid staff. Our sincere appreciation to all Foundation supporters, volunteers, committee members, and board members who contribute their invaluable time, item donations, and charitable dollars! How Are Foundation Dollars Used? Proceeds from the annual event are used for two important functions, both of which directly benefit St. Viator families. A portion of event revenue is dedicated for a capital improvement project on campus, and a portion is placed in the Foundation’s principal account. Interest from the Foundation’s principal account is transferred each year to St. Viator School to augment its annual operating budget. In short, the Foundation funds much-needed capital improvement projects and it augments the school’s annual budget. Foundation contributions to the school are nearing $2 million! Without the Foundation at work for the past 27 years, our school families would expend considerably more for tuition and special assessments. Imagine paying $2 million without the Foundation! As you can imagine It takes a lot of donated items as well as donated hours to successfully raise the money needed for our school. If you have items to donate or have contacts that you would like to share with us please don't hesitate in contacting us. We are happy to pick up items or you can drop them off in the School or Parish Office. If you are interested in serving on our committee, please join us in planning this wonderful event.